What a difference a day makes, especially if it has a bit more breeze. As day 3 of the Miami World Cup progresssed the increase in the breeze meant that the snakes and ladders of the first two days was replaced with some solid racing. Not least among the British competitors facing their medal races on Saturday . . . the RS:X, Nacra 17, 49er and 49erFX events. In the 49er Dylan Fletcher and Stuart Bithell added a 1, 2 and 5, and move into second place overall behind Germany’s Erik Heil and Thomas Ploessel. James Peters and Fynn Sterritt slipped to fourth overall. 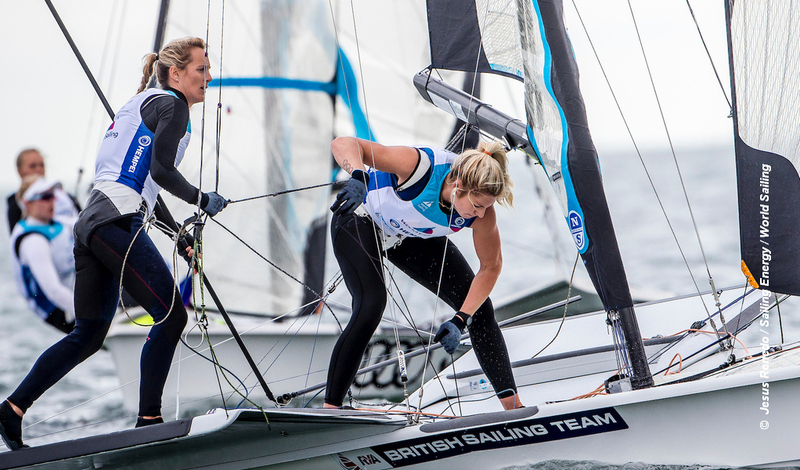 Charlotte Dobson and Saskia Tidey turned things around in the 49erFX, winning race 5 and moving into second place behind Alexandra Maloney and Molly Meech of New Zealand. Sophie Weguelin and Sophie Ainsworth dropped to fourth overall. In the women’s RS:X Emma Wilson moved into fifth place overall after a 2, 6, 3, scoreline for the day. Not such a good day for Bryony Shaw who sits in 12th after a 12, 8 and 22. In the Nacra 17, John Gimson and Anna Burnet opened their day with a 1 – 2, and although they did not keep up that performance level they are in third place overall after nine races. In the women’s 470 a win for Hannah Mills and Eilidh McIntyre in race 4, was enough to move them into second overall behind Agnieszka Skrzypulec and Jolanta Ogar of Poland. While in the men’s 470, Martin Wrigley and James Taylor took their first international regatta race win, and are 15th overall, just two places behind Luke Patience and Chris Grube. Alison Young tops the Radial event, one point ahead of Denmark’s Anne-Marie Rindom.